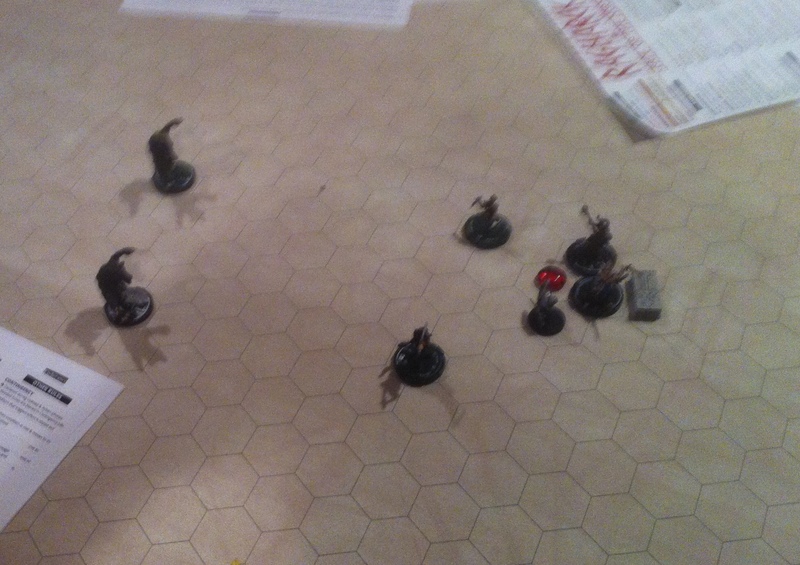 made some enemies…well, mostly enemies at this point and killed a few undead polar bears. Some of my players typed up an in character summary of what happened. Here they are. Sigurd and Thorvald “The Undertaker” have been friends for some time now. They both enjoy the dead more sometimes than the living. They both enjoy speaking with the Angels of Death, revere their beauty and roles they play in this land… Sigurd also sees some of Sigil in Thorvald, while he can be rough on the edges Thorvald is a good man.. Sigurd enjoys travelling with him, life is always an adventure and Sigurd would be honored to die beside Thorvald in a hero’s death. So our story begins as Thorvald has received a contract to bury the dead (Inga) in a far away land. So, Sigurd and Thorvald find themselves in need of transportation to Iceland. They come across a ship’s captain in the port town. Her name is Bola. Bola is a mercenary/captain who likes gold and calls her weapon “Vira”. She has two companions Ragnar “the Free Spirited” and Grimnir “the Varangian” a seasoned traveler who has been across many lands and fought in many of them. Sigurd seeks to negotiate passage on her ship and buys a round of drinks for the bar, then he begins the critical negotiations with Bola and after a short while she will allow Sigurd, Thorvald and Inga (the dead) on the longboat. Very pleased we agree to meet in the morning to head out.. The next morning upon arrival to the ship, Thorvald and I are carrying Inga. I have to say it’s more like Thorvald is carrying his end, but my old bones and having challenges carrying my side. I am also thinking that Inga is VERY HEAVY for such a young and thin looking lass. Anyway, I struggle, but don’t drop the dead woman…. I start to make a LIST OF WHO WE CAN FIGHT TO HAVE A HEROIC DEATH!!! I place the Undead Bears on the LIST…. 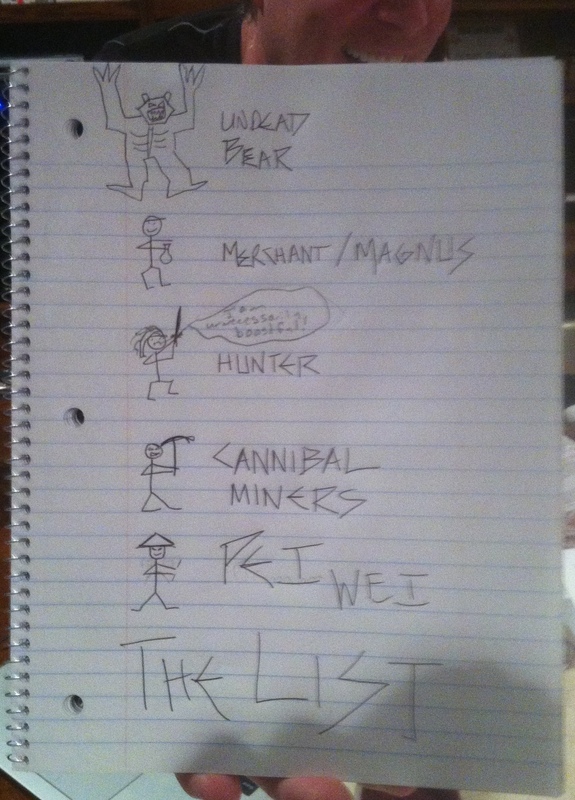 The Cannibal Miners are…….. ADDED to the LIST!!!! Odin, finally a good person. During the discussion, we find out there are two immortals in town and the one that represents the Gods, is actually not trustworthy and the other representing the Giants can be trusted. Bola or whoever she says she is now, whispers to me that the Godi knows more than he is telling and may be lying to me.. I directly confront the Godi (as I plan to die a heroic death any day know and don’t have time for pleasantries). He seems offended, I wonder who is working for Loki here either the Godi or Bola (or who ever she is now).. I will most likely die soon, so I may not have time to unravel this mystery..
Then we see a very wealthy man, and meet the Merchant Magnus and his guards We start a conversation with Magnus and realize he is just exploiting these people. We don’t like him and let him know that.. Then he walks away.. I think HOW RUDE……. So…… I add him MAGNUS THE MERCHANT and his Guards to the LIST!!! Next we decide to save the town from the Brutality of the Undead Bears (secretly I check the list and believe this might be my glorious death, I am so excited, I may see my fathers and mother soon)…. Meet Hunter Grim (on the List) – He is a skilled and boastful hunter…. (he seems powerful and is maybe deserving to be on the list). As we speak to him, he is boastful and powerful as a hunter. But as Thorvald points out, he spends his time boasting versus saving the town from other bears… He claims to have killed one… For his pride, boastfulness and power he Grim is………… Added to the LIST!!!!! We then tell Grim we are heading to get at least two bears pelts to show him we are greater. I also secretly want to kill all the bears and free this town from the icy grip of BEAR DEATH and BLOOD, hopefully one of the Skald will write an epic saga of our salvation of this town…. I will then get entry into Valhalla. <OUT OF GAME – MY Loving Wife head to pick up a food order for 6 starving gamers to have dinner…., It takes over 1 hour because PEI WEI gives our food to the wrong people and they have to re-make the order…. FOR THIS!!!!! PEI WEI is ………………….. Added to the LIST!!!!! So back to our adventurers as they sleep on the white snow, approx. 2 am in the night two undead bears attack the camp.. During the conflict we have a glorious fight, blood is spilled on our side and we vanquish the 2 giant Undead Bears…. For more details… Read the “Heroic Poem of Sigurd, the Bears of Undeath and Saving Bola the confused” (Coming soon)…..
At the end my entrails are being stuffed back into my body, I was moments from death, but this is NOT my time… But hopefully soon……. We have more Undead Bears to track and kill and I need some rest…..
noticed one of them was the one that the hunter had skinned. That put us into overkill mode, and we chopped everything but the heads into tiny pieces and then burnt the pieces. It was a great victory, but our time on this island is long from over.